On the third and final day of WFX, I spent almost the entire day on the show floor. We're getting ready to upgrade a lot of equipment at Coast, so I needed to get some hands-on time with as much gear as I could. Here are a few things I saw that impressed me. 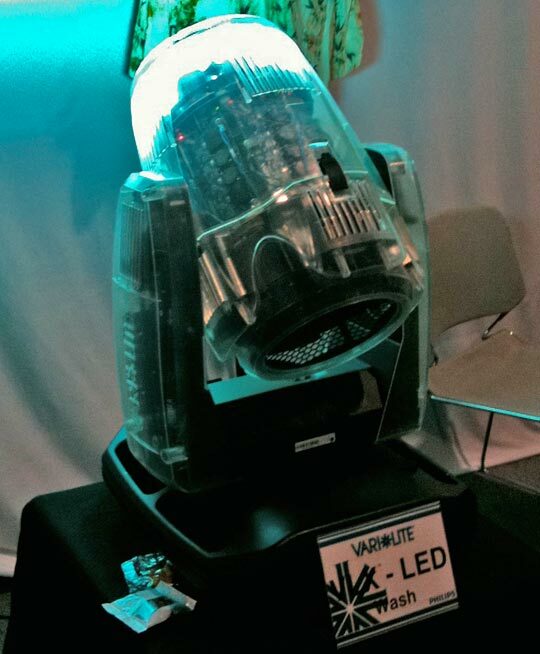 The new VLX Wash fixture.This is Vari-Lite's first foray into the LED moving-head market, and it's a big one. With an output of 14,000 lumens (full white), it's quite bright. The field of light is very even, and the fact that the color temperature is continuously variable from about 3,000 to almost 9,000 is a very nice touch. The colors are rich and intense. It seemed reasonably quiet on the not terribly noisy show floor, and it's heat output was a fraction of a nearby 2500. 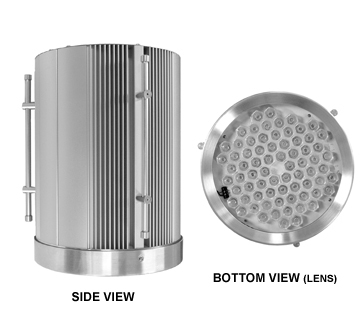 It is designed as a wash fixture, and has a zoom range of 23-58 degrees. The only real downside is the cost--almost $8,000. However, when you consider that the LED modules are rated to last 10,000+ hours, it's not a bad value. Not sure you can order them this way, but it looked cool!They had one on the floor with a clear case to show off the internal guts. Each LED module is designed for easy removal and replacement if needed. Wybron LED SpotThis is a nice fixture. Sadly, I can't tell you much about it specifically because Wybron has 0 information on their web site (and I didn't grab a tear sheet). What I can tell you is that it's crazy-bright, produces rich, saturated colors and kicks out a really nice white. If I remember correctly, it's a RGBW fixture, meaning there is actually a White LED inside--that gets the whites dialed in well. We looked at the output on the black ceiling of the convention center (a good 25') and it has some punch. I will go up to 9 channels of DMX for very fine control. They had it set up next to a Color Kinetics ColorBlast 12 and an 11" Selador. There was no comparison. The Wybron LED blew them both away, both in output and in color intensity. 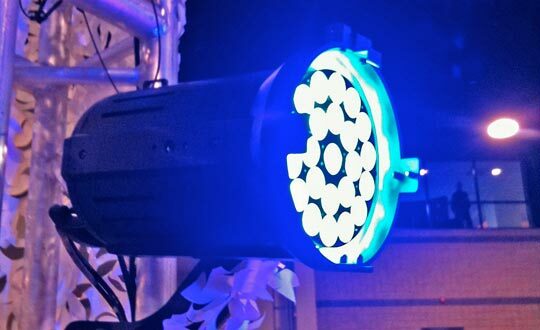 It's a bit pricey on a single fixture basis (around $2,200) however, when you consider the output, it does the work of 2-4 other fixtures in the LED market. So it's not a bad value at all. Wybron--get this on your web site; you have a great fixture here! The SamePage system. (the white spot on the near monitor is a reflection--sorry about that! )This is another product that I'm pretty excited about. I went to WFX fully expecting to be ordering an Aviom system for our band. I had heard about SamePage and was a bit curious, but left the booth (after 45 minutes) pretty much blown away. SamePage started off as a sheet music replacement. 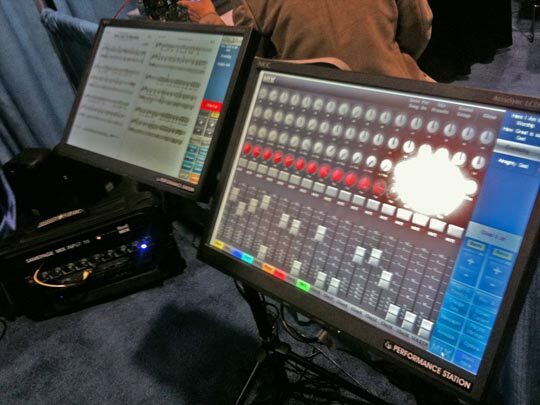 It has a very powerful software engine to manage, display and annotate sheet music--on a touch screen monitor. Similar in size to a large music stand, all the stations are tied together on a network. When the music leader advances songs, all the other stations follow along. If notes are added, everyone gets them. The music leader can build playlists from home, and when the band arrives, all the necessary music is on their station. Pretty cool--but as a tech guy, I don't care that much. That is, I didn't care until they added the mixing module. Based on the Mamba digital snake system, SamePage has integrated a 16 channel personal mixer into each station. Taking cues from Aviom and RSS, they have build a very powerful personal mixing network. It's possible to send up to 32 channels down the network (from either ADAT, AES or Analog inputs) and let each station select up to 16 of them. Each musician can then mix, on the touch screen, their personal mix. Each input features a simple 2 band EQ as well as panning and muting. You can even name each channel. Latency is around 60 microseconds with a digital input, so it's really not a factor. The cost is slightly higher than an Aviom system, but given the added functionality of the music system, it's an easy sell for me. I expect to be getting some demo units next week (hopefully! ), and will write more once we get hands on. There is a lot to this system, and I can tell you it's put my Aviom order on hold. It was also great to talk with the guys from SamePage and hear their plans for upcoming products, some of which are on the down-low--but I can tell you it's going to be cool. 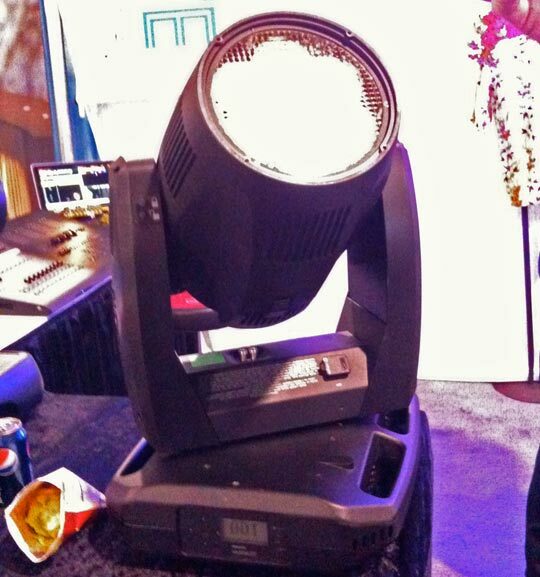 The LED-based DL.This is another one of those products that for me, is a game-changer. These are good-looking, insanely bright LED architectural lighting fixtures. The current DL product is white--you specify the color temperature when you order. It's fully dimmable, with an extremely smooth dimming curve. There are four fixtures, with outputs ranging from just over 4,000 lumens to over 15,000. They replace incandescent or Metal Halide fixtures, matching output for about 1/2 the power consumption. Couple that with a 50,000 hour life, much lower heat output and consistent color temperature over the entire dimming curve and you have a great product. We're looking hard at these for our house lighting fixtures. They also plan on doing a RGBW version on a moving yoke. When Teddy of Affineon told us about that, I said we had to see one when he had it ready. So stay tuned for a hands on review of that once it's available early next year. So there you go. There wasn't a lot of great new stuff on the show floor this year, but the stuff mentioned here in these posts is what made an impact on me. More to come as I get product in my hands to play with.